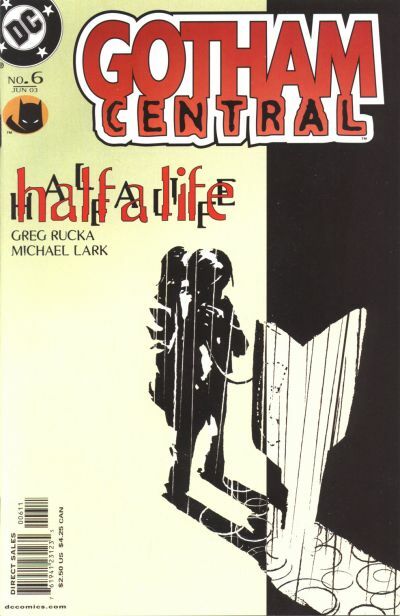 Gotham Central #6 by Greg Rucka and Michael Lark starts the classic Half a Life storyline, which centers on Renee Montoya. By Jack Sharpe — In December 2002, DC launched a new comic that was very different from the usual adventures of Superman or Batman or Wonder Woman. This comic would run for 40 issues, focusing not on super-powered heroes themselves, but instead on the members of the Gotham City Police Department, the everyday people working to make a living and keep the city safe. This comic is Gotham Central. Written by Greg Rucka and Ed Brubaker, with art from Michael Lark, Stefano Gaudiano, and Kano, Gotham Central is, simply put, one of the most important comics of the 2000s. A large part of what makes this book so important is the characters at its center. The protagonists in Gotham Central are not aliens from other planets, and its villains are not trying to take over the world. No, this comic’s story is small and personal. Gotham Central is the story of the GCPD, the story of Renee Montoya, Crispus Allen, Maggie Sawyer, Marcus Driver, and others. It is the story of Gotham City, the very same inhabited by Batman, seen here through the eyes of police officers and detectives. Seen in a way that makes Gotham City feel real. From Renee Montoya revealing a deep secret to Stacey the GCPD intern and her fantasies, Gotham Central presents a wide array of characters who are rich with relatable humanity and realism. What I’d like to explore today is one of the stories found in Gotham Central, paying special attention to how it makes this series such an important work of superhero fiction. Gotham Central’s unique and thought-provoking storytelling shines most clearly through the character of Renee Montoya. Renee had been a recurring character in Batman comics dating back to her introduction in 1992. First created for Batman: The Animated Series and later adapted to comics, Renee was a detective who spent most of her time partnered with Harvey Bullock. At the start of Gotham Central, Bullock has been kicked out of the GCPD, and Renee is now partnered with Crispus Allen. The storyline Half a Life, which appears in Gotham Central #6 - #10, focuses on Renee, who experiences an emotional ride that includes everything from sadness to anger. Renee’s story is told in a way that really makes readers empathize with her, really makes them feel her pain. It is, quite frankly, one of the best stories to ever be told through superhero comics. To understand Renee’s arc in Gotham Central, one must first understand Renee. She is a no-nonsense cop, dealing with both her police career and her family life. She is also hiding something from many of those closest to her: Renee Montoya is a lesbian, currently in a relationship with another woman. She is also a latina from a very Christian family. Renee’s struggles with her sexuality and her family’s reaction to it in Gotham Central are something many people all over the world face. She fears being disowned by her family and looked down upon in her work place. Essentially, Renee knows that being honest about who she is could be disastrous for her relationships. Sadly, Renee also has enemies in Gotham. And in Half a Life, one of those enemies discovers her secret and outs her in her workplace. As a result, Renee’s relationships at the GCPD and with her family change. She is shunned at work by many of the officers and detectives. Perhaps worse, Renee’s parents disown her. The scene of Renee in her lover Daria’s car breaking down in a flood of tears as she tells Daria about her parents is truly heart-wrenching, written and illustrated by the creators in a way that really makes you feel her pain. Basically, writer Greg Rucka and artist Michael Lark craft a story here that shows how we as humans all have a breaking point, no matter how tough we are. Half a Life builds to a crescendo, while also planting seeds for continued growth for Renee throughout the series. By the final arc of Gotham Central, Renee leaves the GCPD, disgusted both by her treatment and the corruption she has seen in the department. The events of Gotham Central and the story of Renee Montoya are later followed up on in 52, where Rucka again takes the character and creates wonderful stories for her. There are other stories and character moments throughout Gotham Central that also show a real side of Big Two comics that we do not normally see. But to me, the best example of these moments and the style of storytelling that makes this book so important is still Renee Montoya. Before I read Gotham Central, Renee was a character I did not know all that much about. Now, I know who she is, and, more importantly, I know why so many readers hold her as a beloved favorite. Her story is one of identity, sadness, anger, betrayal, and ultimately growth. In Gotham Central, Renee faces difficult circumstances and obstacles, and she faces them in a way that shows who she is: someone who can overcome challenges and feelings, who can deal with suffering and use it grow into much more. Her pain and how she responds to it is something all readers can relate to, can aspire to emulate. Renee Montoya becomes a question (more on that in 52) and an answer. She is a special character and her story makes Gotham Central a special book. Check out more great writing about comics!